Features and Specifications: Multiple grip positions allow you to build and tone upper body compound muscles.Develops biceps, triceps, forearms, and abs.Professional quality, heavy duty, and portable.Comes with thick padding and non-slip comfort grips.Simple assembly; easily attaches and removes from the door frame.Fits doorways with sturdy frames 24 to 36 inches wide.Maximum weight: 300 pounds (with sturdy door trim).Perform chin ups, pull ups, sit ups, and triceps dips and more with a single product. 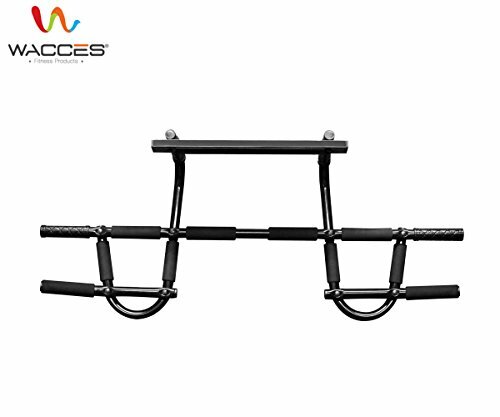 .Can be used with popular DVD workout programs.The multi-function chinning bar for strengthening pecs, biceps, abs, and obliques. .Portable and easy to take down. .Easy & user-friendly assembly. .Assembly instruction included.